It’s getting very close to Christmas day. If you know me I always keep things last minute then get overwhelmed. But this year I’ve bought all the presents only one left. So one step ahead. If I'm not careful over this season, I can lose the joy and the spiritual meaning of Christmas and get bogged down with all the practical details which are very necessary to make things happen. But here I want to share my view on Christmas and what it really means to mean on a spiritual level. It is the season of Divine Light and joy. Divine Light that came into our world to illuminate our dark souls. It can easily turn into a stressful time instead of a time of peace and joy. The Divine Light is guiding us today to look at what really matters and to enlighten our hearts. I love the idea of Gold symbolising light. Gold fascinated humans for thousands of years. It is the symbol of eternity, heaven, purity, radiance, light and inner illumination. Gold does not change colour under any circumstances. It's the same now and forever. It is a symbol of the eternal! In the sacred icons it’s the symbol of heaven. 'Hold the Light' paintings are my gift to bring the Light of Christmas in your life. They are small jewels of light to hold, to look at and remember the Divine Light of this season. 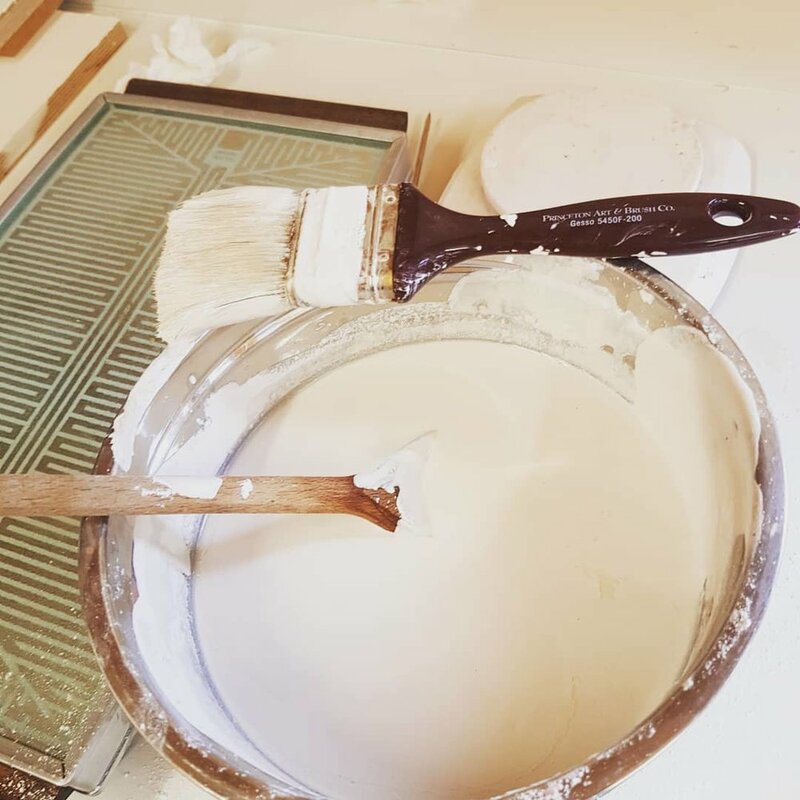 There are specific steps I take to create each painting: preparing the boards, making the gesso, sanding the boards, preparing the clay, laying the gold leaf and burnishing. I love how the three kingdoms come together in these paintings and all my paintings: Animal: where I take the glue from; Plant; where the wood comes from and Mineral: where the clay and gold comes from. So the painting becomes a microcosm of the cosmos of creation. This kind of ritual requires me to be quiet, slow down and focus: to be mindful of my moment and of God. Painting for me is more than preparing the materials, it's about preparing my soul to connect with the Creator, the source of light so as to co-create. It’s a contemplative spiritual prayer. Here are some photos to help you see the process in action. I start with preparing the ground by mixing my own gesso (a special paint made with glue and chalk). Many layers up to 8 are painted on birch plywood. The board is sanded when it's completely dry to a very smooth surface ready for the clay. The second stage is to mix special clay, paint it, sand it till it's so smooth. This will prepare the surface for gilding where I will put the genuine gold. Then comes the part where I literary have to hold my breath. The gilding. Gold is the most malleable material on earth. For ' Hold the Light' I used genuine gold in two different colours: Yellow using g 23.5 ct gold leaf and white gold. The gold comes in extremely thin leafs, that requires high skill to handle. Around 250,000 sheets will make 1 inch in width. Wow, Imagine that..! When I work with gold I have to treat it with love and care, appreciating its spirituality and beauty. Having a painting with genuine gold in your home adds magical light and beauty that nothing else can math. No paint or any other metal! Lastly is the burnishing phase which actually means polishing to make the gold shine. It has to be done in a window of time otherwise it doesn't work using a special agate stone. Gold can be burnished till it shines like a mirror. It's a fascinating metal! and no matter how many times I work with it everytime I’m fascinated and excited. The more I work with gold the more I fall in love with it. I love all the different stages that go into each painting. It requires me to stop, pause and quite myself in a busy time. 'Hold the Light' is my prayer that the Divine Light will shine into your heart this Christmas. Hold the Light in your hand and heart and absorb the love and peace this Divine Light of Christmas brings you. Christ is born!